A walk-in clinic advises Only Certified Service Animals Are Allowed, as per Department of Health Policies. One wonders if easily certified Emotional Support Animals qualify. 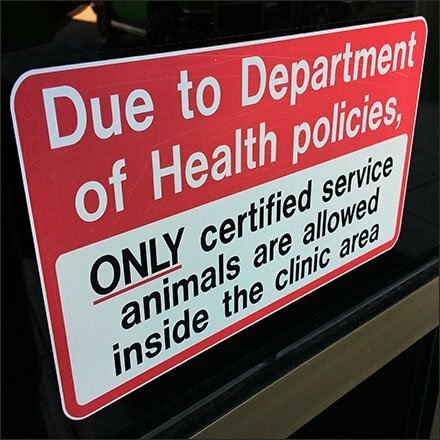 I am sure I would not take a pure pet to a walk-in clinic, but apparently enough people do, requiring a posted advisory. But upon seeing this Only Certified Service Animals Are Allowed mandate, what is your response? Leave Fido or FiFi in the closed car on the parting lot? I have see Leash Tie Points offered at Farm Stores for tethering accompanying animals. Maybe the practice could find use in urban retail settings.